Covert Hoody - Mens is rated 4.5 out of 5 by 16. Rated 5 out of 5 by avidalpinist from Great all around warmth layer! The Covert Hoody is a durable and functional fleece layer that serves well as an outer in chilly conditions or as part of a layering system for colder weather. 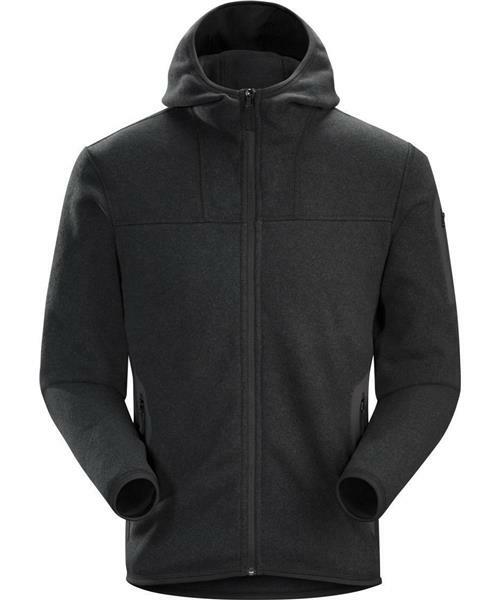 I have had my Covert hoody for going on 3 years now, and while it sees near daily use during the colder months of the year, you would not guess it from how good of condition this garment is in. The Mid-weight fleece is soft to the touch, but durable enough to survive years of abuse. The garment features a great trim cut which allows the hoody to layer extremely well with other Arc'teryx jackets and layers to provide a comfortable, seamless fit without bulk or reduced mobility. This hoody will keep you warm and stylish for years! Rated 5 out of 5 by Cdub from Favorite hoody I've been really happy with this hoody. It's my go to hoody in the fall and winter. Weave is similar to a wool sweater though its lighter, softer and more comfortable. I use this mainly for casual use, though it works well as a base layer under a shell too. For heavy use, like alpine climbing or backcountry skiing I'd pick something without the hood and a lighter material. Great for casual hikes or snow shoeing. Cut is athletic, style is sleek. Rated 4 out of 5 by Easy from Almost perfect... This is my very first piece of Arc gear and I'm ashamed it has taken me this long to jump onboard. I doubt I'll be buying anything other than Arc'Teryx from here on out, but I digress. On with the review... This hoodie is near perfect save one tiny complaint: it's a tad short in length. I'm 6'0, 190lbs and my average large-sized t-shirt hangs out beneath this hoodie. Drives me nuts! That really is my only complaint, which is why I rated the size as fitting a little small. The Polartec is incredibly warm and very breathable, and I've used it as a mid-layer on several occasions with great results. I do a lot of tactical shooting and I'd very much like to see an enhanced LEAF version of this hoodie at some point. Add shoulder or bicep pockets with Velcro IFF panels and a strip of 400 Denier nylon under the arms to protect the elbows and forearms, offer it in Croc, Wolf, or Multicam and voila, another Arc'Teryx winner! I'd buy one right now. Just make the bloody thing an inch or two longer please. Rated 5 out of 5 by Samm from Extremely warm! This sweater is incredibly warm, i was amazed at just how warm it is, I have worn this along with a base layer and hard shell well below zero and have always been toastie warm even when not active its very warm yet breathes well. The fit is spot on and allows free movement without restricting you in any way, the cuffs seal off nicely to stop the cold getting in and the hood keeps your neck and head nice and warm. The tight weave makes this sweater nice and durable i wear mine often and have had it a while with no signs of wear. Great sweater! Highly recommend! Rated 5 out of 5 by Herbert from Best Sweater out for a beer! Best Sweater out for a beer! It is very warm, very soft skin feel very light and in turn, the hood helps for times when the temperature drops when you leave the bar!! is very presentable and also if you have any meeting or social event! who want to be well dressed and protected this is your choice! Rated 4 out of 5 by RangerRyan from More for casual wear I purchased this just a few weeks ago, so I can't yet speak to how this jacket will hold up in the next ten years. It's a good-looking jacket that keeps me warm down to the low-40s or so. It doesn't have a lot of bells and whistles or large logos on it, which is a plus in my book. One thing that is a little funny with this jacket is the sizing. I have a medium Theta SV, which is obviously a much different jacket, and it fits perfectly. I ordered the Covert Hoody in a medium. I thought that it would run a little big since it has a relaxed fit. It actually is a little bit tight. I'm 6 feet tall and weigh 180 pounds by the way. So, I found thre sizing to be a little different from other Arcteryx jackets I've worn. Summary: be careful with the sizing; it looks good, but it's got a simple design; it's probably good for 45 degree weather and warmer. Rated 5 out of 5 by Paul from Best hoody ever owned I bought this last year i was attracted to the beautiful looking material and i must say its a chick magnet.Girls check me out all the time wearing this hoody.Its like a very smart cardigan with a hood with oozes quality.In cold windy weather i recommended you wear a long sleeve base layer as the sleeves are very breathable and let cold wind in but the rest of the jacket is reinforced and can stop the chilly wind. Rated 5 out of 5 by Jonathan from Breathable and warm! I bought the Covert Hoody early this year in green. I absolutely love this fleece hoody. I bought an Atom hoody for mid layering as well. This Covert hoody does all the good things a fleece should do and more. I've had experiance with a few other high end brands fleece hoody's and they all just fit funny, kind of baggy around the waist and the fleece was always too thick or much too thin. Arc'Teryx hit the nail on the head with the Covert series of fleece. It has a perfectly sized hood, just like all other Arc'Teryx jacket hoods, the Coverts' also fits perfectly and looks the part. The fit is tailored, but it does not ride up when raising your arms. I've warn it also in 70-75 degree temps with no problem. Other fleece are just much too insulated and don't breath, something the Covert does very well. Another A+ item from Arc'Teryx. Once you buy Arc'Teryx and experiance the quality, all others will seem second rate. Arc'Teryx, you have converted me!